I tried a new technique, tea bag folding. I love the many ways paper can be manipulated. 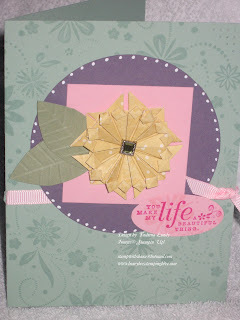 I used the It's Beautiful Wheel for the background and A Beautiful Thing stamp set for the sentiment. Let me know what you think. It seems to be missing something. Beautiful! I love your folding! My MIL would love this too, I should show her. I found you from the thread on SCS!! Nice to meet you! And funny joke! Wow, what a great card!!! So pretty! If I tried it you'd think it was a crmpled mess when I was done! LOL! You got talent to do that! lovin' this tea bag folded flower! beautiful! Beautiful. I love the mini designer bags, they are so much fun to make!